Do you often include multiple translations in a single email message? 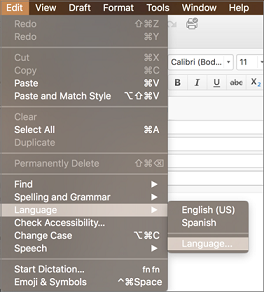 If so, a great time saver is to have Outlook for Mac detect and spell check those translations for you automatically. It's a two-step process. First, select the languages you use most often. Next, compose your message. On the Mac, select System Preferences ( ) > Language & Region ( ). 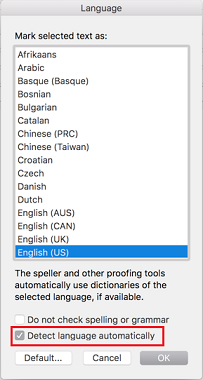 Under Preferred languages, select +. Select the language you plan to use > Add. If Outlook is open, exit and restart it so the language additions can take effect. Open a new email message, place the cursor in the body of the message, and select Edit > Language > Language. Select Detect language automatically > OK. Outlook will remember this setting so you won't need to set it again. Type the text of your message in each language. Outlook will automatically check as you go and mark the misspellings with a red line. Tip: Language detection works on full sentences only. Be sure to end your sentences with punctuation to trigger language detection. Press Ctrl + Click to select from a list of suggestions for the misspelled word.